Attention, brave and loving hearts! 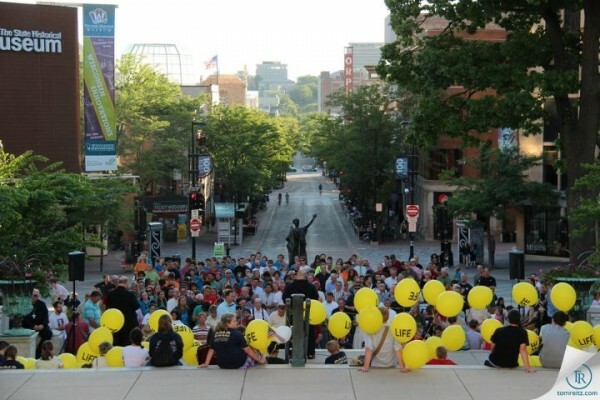 Fr Isaac Mary Relyea and Fr Rick Heilman invite you to kneel in prayer together every Thursday evening, at the State Street steps of the Capitol in Madison, WI. Download the Rosary Rally poster! 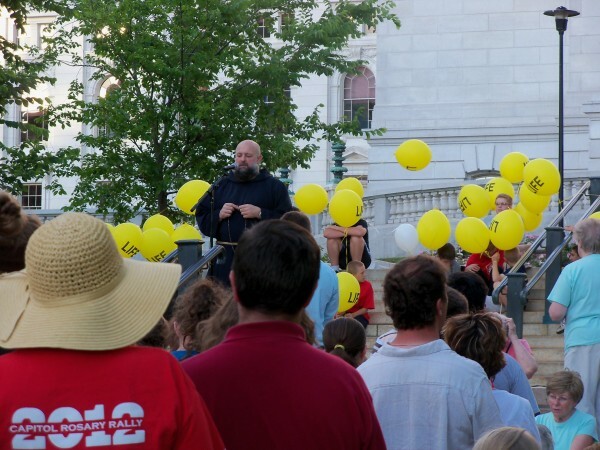 View an excellent video of the first Capitol Rosary Rally, on June 19th! 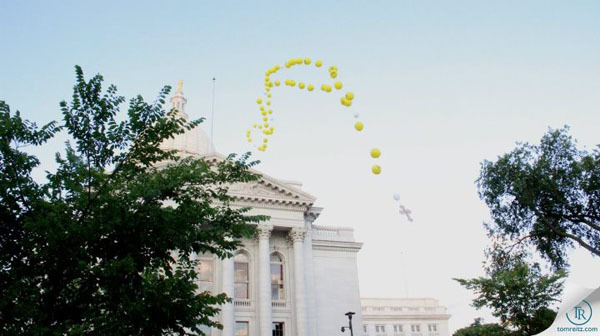 The Balloon rosary was recovered the next day a remarkable 356 miles away, by a Catholic family in northern Michigan. They read the note on the crucifix and right away wrote a wonderfully sweet letter they sent back to St Mary’s in Pine Bluff telling about their family, and the finding of the rosary snagged on a tree near their horse pasture on their son’s birthday and how it seemed to be a sign of faith, reminding of Mary’s intercession, and also of the nearness of the late grandmother of the family who was devoted to the rosary. Their parish, coincidentally, is also called St Mary’s! We saw “For Greater Glory” on opening day last Friday, June 1, 2012. We are going again tomorrow, Saturday, June 9.
the Capitol Rosary Rally planned for the first night of “Fortnight For Freedom”, Thursday, June 21, 2012, in Madison, WI, at the Wisconsin State Capitol, from 7-9 p.m., and every Thursday after that, up through November 1, All Saints Day, needed to go national. This website was begun as a tool to alert all 50 states to join this appeal to pray at every State Capitol those 20 Thursdays, from June 21, through Nov. 1, in union with each other, from 7-9 p.m. This would correspond to your 7-9 p.m. Local Time. Please pray in front of the Blessed Sacrament during that time if you are unable to attend the rosary rally at your State Capitol. We are praying as the family of God, across the country, for Life, Family, and the Salvation of the World. Please let us know when you read this and organize your State rally. God bless you and may our prayers be answered in the Name of Jesus, through the intercession of our Dear Blessed Mother. God bless you for this Rosary Rally effort! I live too far from my state capitol (Olympia) to attend in person, but promise to pray every day – especially Thursday evenings – for religious freedom in our state, our country, and the world. Like you, I was truly impressed by the movie “For Greater Glory”. Everyone should see it! And thank you for posting the cc2w.org video “Test of Fire”. That is a simple, yet powerful statement, and every Catholic needs to see it. We must never doubt the power of prayer, especially the Rosary. So let us all join in to ask Our Lady’s help in this battle. We ask everyone to pray the daily family rosary. 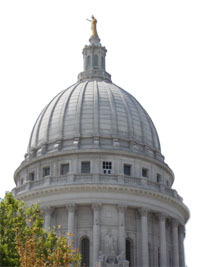 On Thursdays, from now, June 22, through Thursday, November 1, 2012, which will be 19 more Thursdays, we ask that you do make the trip to your State Capitol to pray the rosary. We will pray that you recive a miraculous assistance to make the trip to Olympia, Mary (a beautiful name! ), and that your beautiful heart of fire for Our Lord and Our Lady will catch on to others. If you can not make the trip, we ask that you contact those in Olympia who should be able to put this Capitol Rosary Rally together, and tell them they can contact us for any help. Mary-thank you and God bless you and keep witnessing for the Faith! We will pray that you receive a miraculous assistance to make the trip to Olympia, Mary (a beautiful name! ), and that your beautiful heart of fire for Our Lord and Our Lady will catch on to others. 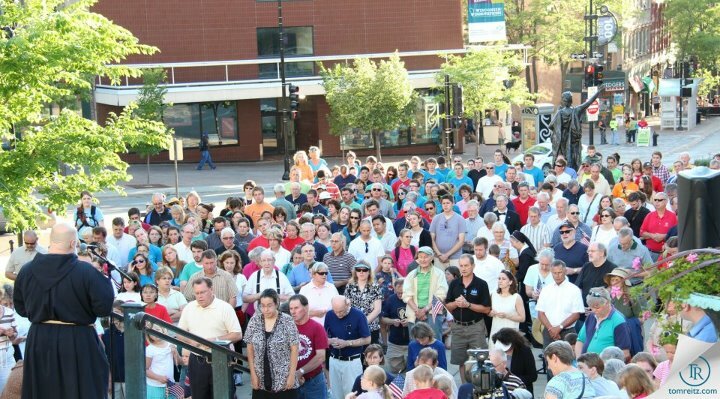 Bishop Morlino Kicks off the Fortnight for Freedom/Join us for weekly 7pm Thursday evening Rosary Rallies! The Rosary Rally is back in 2013! Join us Thursday, June 20th at 7pm! LoveGodAndAsHeLoved on The Rosary Rally is back in 2013! Join us Thursday, June 20th at 7pm!